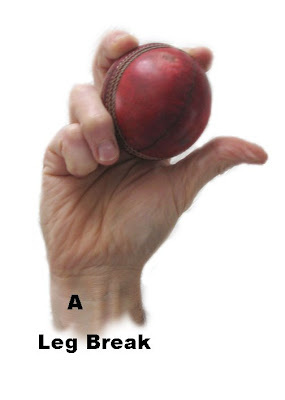 The Legbreak; Of the several deliveries that the wrist spin bowler uses this is the primary weapon. Attributed to right arm bowlers the ball is bowled relatively slowly in comparison to the medium pacers and fast bowlers. The ball is pitched up towards the batsman at different and varying lengths and then spins away towards the Slips fielders. So from your point of view as the bowler the ball lands and spins away to the left. From the batsmans perspective it lands and spins away to his right as he looks up the wicket back towards the bowler. From your point of view as the bowler it's necessary to be able to make the ball spin away from the point it lands. The levels of accuracy required for both the length and the line are exceptionally important and as a leg spinner the ability to bowl different, speeds, lengths and line all combine to make this a tricky ball to play. The Legbreak has a number of other attributes - Dip, Bounce and drift. Bounce; This is an obvious consequence of the ball suddenly dipping. If the ball was to have been thrown a similar distance without spin, the entry angle into the impact with the surface would be mariginally lesser than the mirrored exit angle. So seeing the ball pitched up above the eye level the brain would then calculate expected entry angle and exit angle out of the bounce and quickly put into action a strategy with the bat to deal with the ball. But then the magnus affect causes the rapid dip and surprising high bounce that is designed by the wrist spinner to be either struck on the glove or the top edge of the bat forcing an error whereby the batsman will be caught. Drift; This is another attribute caused by the fact that the ball is spinning and is a consequence of the Magnus affect. As well as potentially dipping at the last moment because the ball is spun with the seam at 45 degrees it cuts threw the air and reacts in a way that causes it to swerve off it's initial line swerving in the opposite way to the spin direction, so it swerves towards the leg side. The Grip; The grip is described as a 2 fingers up, 2 fingers down with the 2 up fingers across the seam as opposed to along the seam in the case of medium pace and fast bowlers. The most important finger is the 3rd finger as it's this that imparts the spin on the ball. It's easy to get really hung up on the grip as there are loads of opinions as to how you do it. Some people have a loose grip, others have a tight grip I had success when I was learning with a solid grip but making sure that the gap between the two up fingers and the 3rd finger was quite wide. I find in my bowling that now the up fingers and the thumb have very little to do with the bowling action and that the position on the seam is absolutely essential. I have to make sure that I place the 3rd finger very purposefully on the seam and concentrate as I bowl on ensuring that the 3rd finger stays on the ball till last micro second. It's this 3rd finger dragging across the seam as the ball comes out of the hand that puts the spin on the ball. Other people I've observed have very different grips, kids I've noticed including my 7 year old have evenly spread fingers which make their grip look like a conventional 'Holding the ball' grip, but their fingers are all across the seam and they get it to spin. I remember when I first picked up a ball I did something similar and just used a flick of the wrist and got it to turn. Currently I'm noticing the subtleties of my own grip make a big difference. Currently I'm employing the 'The Straight Ball with the drag off the 3rd finger' approach (See below) and I'm noticing that this gets the ball turn particularly well and it very accurate. By not rolling the ball off the 3rd finger so positively and using subtle changes in the wrist position more top spin and less turn is acquired and this produces a different ball that keeps the batsman on his guard. Round the Loop; There aren't that many resources available to the wrist spinner but the most important is possibly the book The Art of Wrist Spin Bowling by Peter Philpott. ISBN 1-86-126-063-6 published by Crowood. Philpott in this book writes about the subject in great depth and anyone learning Wrist Spin bowling needs to get a copy and read it not once but several times. In the book as Philpott describes how to bowl wrist spin he uses the analogy of going 'Round the loop' to describes the position of the wrist in conjunction with each of the variations. It was through reading this book and realising the relevance of the wrists position that I was eventually able to bowl the Leg Break. So look at the diagram and consider the wrist in relation to the batsman. All of the main images here depict the view of the hand and wrist as the arm comes over so the images are of the hand position as seen by the batsman. The Loop aspect describes the rotation (Twisting) of the wrist with regards to each of the deliveries. The Leg break has the under-side of the wrist as it comes over the top of the head in the delivery facing the batsman with the back of the hand facing you as it passes beyond the position of 12.00 o'clock. Another piece of advice that I was given through http://www.bigcricket.com/ was that when the arm came over instead of the action being that of a fling it needs to be something that is more akin to a push, this for me gives me the sense that the wrist remains in that forward facing position in the delivery and as the hand comes over and down and the ball leaves the hand the fingers unfurl with the 3rd finger staying on the ball for as long as physically possible so that it then spins the ball. I'm currently reading Grimmetts on taking wickets kindly copied and sent to me by Macca, cheers bloke very much appreciated! Anyway he's just mentioned a point regarding round arm verses a more vertical arm. The comparison he makes is that of skimming stones across a pond. Suggesting quite rightly that if you throw a flat stone using a vertical arm action it's simply going to disappear into the water, whereas the sideways arm action means that the flat stone doesn't break the surface and instead skims bouncing several times before disappearing. The inference is that the round arm action facilitates a faster movement off the pitch. The vertical action would mean some of the kinetic energy would be absorbed into the pitch and thus slow the ball down. Some of the mastery with the Leg Break is psychological and a brilliant exponent of this is Shane Warne exemplified for example in the lead up to the Ashes in England going so far as having a giant statue of himself being paraded through central London on the back of a truck coinciding with news reports that he was currently able to produce at least 5 variations including his Flipper which it had been previously reported he’d lost because of shoulder operations. The sense you got from the build up was that England were virtually doomed because of Warne’s presence on the team and his ability to completely bamboozle any of the English batsmen with his ridiculous ability to spin the ball a la the Mike Gatting ball. What I’m trying to say is that with some psychology you can find yourself in a situation where you are in the ascendency before you even bowl a ball simply because you are a Wrist Spinner, so even with a small amount of leg spin you’ve got the potential to dominate the batsmen. You’ve only got to watch small boys with reputations of being spinners bowling against adults at club level to see that simply by flighting the ball and varying the length and speed that spin doesn’t have to be an enormous component of the game. But once you’ve got some spin abilities and skills your potential increases. If you are struggling with the Leg Break, one approach is to bowl the ball with the palm of the hand at the point of release facing the batsman. As the ball leaves the hand the last part of the hand that has contact with the ball is the 3rd finger and it’s this that imparts the spin. This approach seemingly doesn’t use any wrist action but still produces a small leg break with a good degree of bounce. Some people say that as you bring the ball over you should also have a feeling that you’re pushing the ball forward out of your hand rather than flinging it. If you’re suffering from the Googly Syndrome this may be the solution to getting your leg break back because it focuses your attention on the fact that you need to keep the wrist facing forwards along with the palm of the hand. Also try turning the wrist slightly clockwise so that your thumb comes round towards you and the little finger moves towards the bat so that the hand starts to move towards being in the Karate Chop position. You’ll notice that this small variation in the wrist position affects will affect the spin and the bounce. Many wrist spinners you’ll note will start with their wrists cocked at the start of the delivery and then release the ball with the hand in the ‘Traffic Cop’ position on release. Again if you’re having problems getting your Leg Break together this is an approach that you may want to explore that could potentially lead to a break through or an improvement. The unfurling of the cocked wrist to the ‘Traffic cop’ position with the palm facing the batsman on release involves a degree of wrist flick and incorporates the 3rd finger as the last point of contact on the ball thus producing the spin. You only have to do this gently over a couple yards so that you can step forward and catch the ball yourself and you can see how readily the ball comes out of the hand rotating perfectly with the seam rotating at right angles to the direction of flight. The real leg break requires the big flick. Look at the earlier explanations regarding the throwing of the ball from one hand to the other and the video on-line at (link & Info coming soon) . As you work on this and get used to the feeling you’ll soon begin to develop an action where rather than just rolling your hand over and round the ball you’ll begin to produce an action more akin to a flick. hopefully this flick will incorporate the use of the 3rd finger, the wrist, the elbow and shoulder in putting the spin on the ball. Again the exact way in which this is done varies from person to person, some people note that the amount of work that the 3rd finger does is such that it produces blisters, Shane Warne apparently was able to produce his spin without having blisters or callouses at all. The important thing is that the flick is there. My own version creates an audible sound not unlike the Flippers click as the ball is flicked off my 3rd finger. In trying to understand the wrist flick and the role the 3rd finger plays my own experience is that the sensation that I have is that I’m primarily bowling the ball off the 3rd and 4th fingers, the rest of my hand apart from the wrist has very little involvement in getting the ball to spin, the thumb and the 2 up fingers only support the ball in holding the ball poised against the fingers that impart the spin. When learning this, note the sideways action of the ball being thrown from one hand across the body to the other right to left with the flick. This is the basis of the leg break with the big flick. This is the action that gives you the flick coupled with imparting spin off the 3rd finger. The combination of both. Similarly with the other versions the hand still releases the ball with the *palm facing the batsman, the ball should leave the hand rotating anti-clockwise with the seam at right angles to the direction of flight so that when the ball hits the ground the seam bites and propels the ball towards the off-side away from it’s expected trajectory. You may find that with this variation that your thumb is instrumental in some way and holds the ball in the hand so that the ball is tucked up ready against the 3rd finger on release as the ball is released the hand closes around the thumb. With all these slight variations and approaches there is one consistent aspect and that’s the position of the wrist on release. The underside of your wrist with the veins needs to be facing the batsman on release. Tactics; I think with regards tactics it's easy to get carried away with watching video clips of Shane Warne, as you kind of get drawn into the idea that as a Wrist Spinner you're supposed to be bowling Leg Breaks down the leg side with the intention that they turn round the back of the bats legs. Well - if you are Shane Warne yes maybe. But as a novice wrist spinner you're more than likely going to be better off sticking to a more basic approach. I found as I learned most balls down the leg side get put away quite easily by the batsman. A potentially better approach would be to bowl with an emphasis towards the off-stump. My own approach (RH batsman) is to bowl at middle and off so that each ball is threatening to hit the stumps and therefore needs to be dealt with and not left. I've seen this approach used by a bloke who was playing on a wicket that offered very little assistance in the way of turn, but he bowled a very accurate line but varied his length using his ability to use dip and keeping the ball up above the eye-line. This bloke was in his 60's and bowled about 10 maiden overs out of 13! I vary my line slightly but always keep the ball down the offside looking for opportunities of a catch at point, gully, cover etc. But the line I bowl worries batsmen who are not that confident and with the ball spinning away to slips there's always the potential to force an error. Practice; The key to all aspects of Wrist Spin bowling is practice. Almost without exception anyone that knows anything of cricket all say that Wrist Spin Bowling is the most difficult of all of crickets skills. Therefore it follows that to bowl wrist spin and do it well you need to practice constantly and practice seriously. Philpott writes chapters in his book on this subject emphasising that if you're not obsessed with the idea of being a wrist spin bowler and don't view the prospects of spending virtually every waking hour of your life practicing it you'll never become an accomplished wrist spin bowler. In C.V.Grimmetts book 'Taking Wickets' he makes some observations with regards Medium Pace bowling. He concludes that Medium Pacers should have as a part of their armoury the Wrong Un because he explains that it is far more natural and therefore easier to release the ball out of the back of the hand at speed to obtain spin than it is out of the front of the hand as you do for the Leg Break. This got me thinking. At my own club we have small boys that bowl seam up medium/fast style and seemingly they can turn their hand to bowling a decent turning Leg Break with some ease. Additionally I've suffered a forearm injury which has coincided with my own sons aged 7 and 10 starting to play for a club and the balls that they invariably face are seam up medium/fast. So in order to rest my forearm and give my sons some practice which is specific to their cricket experience I've been bowling medium pace seam up and been really surprised how easy it is to get it on the stumps. I then realised that there may be some logic in Wrist Spinners who are learning to bowl leg breaks or maybe trying to recover their leg breaks to explore Medium Pace Bowling? The theory is linked to the fact that the small boys find it easy to go from one speciality to the other and I rather suspect that this is because the Leg Break delivery shares some commonality with the seam up delivery in that it comes out of the front of the hand, which as I've just mentioned Grimmett observes as being the more un-natural technique in some respects. So might it be the case if you're struggling with the leg break that you leave all of the complex stuff and strip your bowling technique down to basics by applying yourself to bowling Medium pace. Could it be that in doing this you learn the fundamentals of bowling, run-up, gather, delivery, follow through, line and length using a far easier mode and you're releasing the ball in that palm forward style? It strikes me that if you acquire some mastery of Medium Pace and get the fundamentals sorted it may as in the case of the small boys take the adoption of the 2 fingers up, 2 fingers down grip and then apply the cocked wrist and have someone show you that you simply unfurl the wrist in a flick at the point of release to find yourself bowling half decent leg breaks? It then follows that initially you may lose your line and length because you are bowling in a different way, but surely having already mastered line and length with the Medium Pace bowling their would be some self belief in your ability to practice this new delivery and get it nailed? The other thing we do is for the first five overs or so we whip eveything into the keeper and attack the ball as though its a run out every ball just to make the openers think, bloody hell these guys are on the ball. Its impossible to go the whole match doing it but its a good little thing to do when a long partnership is going on to get the fielders awake again and put a bit more pressure on the batsman. Its also intimidating to have a ball whistle past you to the keeper every ball you play if you are a batsman. This is an essential aspect of your bowling and one that is difficult to get the hang of. Bowling the ball short in most instances isn’t going to work as it gives the batsman time to see how much turn you’ve managed to put on the ball, track the ball and then play the appropriate shot. Better batsmen are going to be able to hit the ball easily and score runs and it’s generally seen as poor bowling. If in doubt, or if you’re bowling poorly try and bowl fuller, but not so far that the ball becomes a full toss and arrives at the batsman still in the air having not bounced. The optimum length is a variable distance (3.8 Metres see below) that subtly changes with each batsman, dependent on his position in the crease, his height, reach and the strokes that he plays. I was shown a basic method of judging where to bowl, when explaining to a bloke that I try and bowl around 4.5 yards from the stumps. He said that this was flawed because of the characteristics of each batsman as listed above. His advice was stand where the batsman takes his guard and reach forward with the bat and to draw an arc with the toe of the bat. His advice was the length to bowl was on or around this arc. The theory is that this length is the most difficult to play and generally no matter what approach the batsman takes this length of bowling will cause him far more problems (if the ball is turning) than any other. There are solutions, skip down the wicket and smash the ball back over the bowlers head. Stride forward with a big positive front foot defensive block, angling the bat down killing the spin at the point of contact that ball makes with the ground. Step back and play a back-foot defensive block or play the ball on its merits having watched it turn off the wicket. All of which as far as we’re concerned are still risky, simply because of the length you’ve bowled. This approach can then be further enhanced……….. This is an aspect that is often over-looked by learners of the art as it seems to be a high risk strategy. At the early stages of your development it may be the case that you do not recognize or indeed simply have the skill to bowl the ball with differing degrees of over-spin. Your, Leg Break, dependent on the direction you get the seam to spin in and how much spin you put on it will dip rapidly towards the end of its trajectory. Explanations of this, involve complex physics but an analogy that is often used that people seemingly are familiar with are those using Tennis. A tennis ball hit across the top of the ball with a slice action spins with top-spin and dips ferociously towards the end of it flight path. You may also recognize the action in table tennis as well. The same physics applies to a cricket ball and if the ball is ripped from the fingers and wrist with over-spin (Top-Spin) the ball will suddenly dip from its expected flight path and fall short of its predicted trajectory causing the batsman problems. Additionally, because the ball has suddenly dipped, its angle of entry is nearing the same exit angle once it bounces. This sudden increase in bounce can be unexpected and cause yet more problems, coming off the gloves being a typical dismissal from a ball with more over-spin. The Top-Spinner one of the Wrist Spinners variations is the delivery that exemplifies this affect most dramatically, but a Small Leg Break e.g. one that has very little seam angle will have many of the attributes of a Top-Spinner. Again, this is only conjecture, but even a ball that is spinning at right angles to it’s direction of flight is still over-spinning albeit side-ways and to my way of thinking must include the attributes of dip caused by the over-spinning ball? The brain is unable to predict the exact landing position of a delivery that, for a significant portion of its flight, moves above the horizontal direction of the gaze. So instead of telling spinners to get the ball above the batsman’s’ eyes, coaches should be telling them to get it above his eyes for as long as possible. Bob Woolmers Art & Science of Cricket; 2008; New Holland Publishers; London. Expert batters were better able to distinguish the different types of deliveries than less good players. They also found that for all groups, detection rates (percentage of deliveries correctly identified) were best for Leg Breaks (90%) and Googly (52%) deliveries, but were considerably less good for Flippers (32%), Orthodox Back-Spinners (23%) and Top-Spin (12%) deliveries. Surprisingly, viewing the full flight of the delivery did not add any further predictive value in the case of these deliveries. This study shows that essentially all the relevant information that the batter requires is provided in the spin bowlers action. Thus the batter makes his prediction of what the ball will do in the basis of advanced cues in the delivery action. In addition, it seems that if the ball lands 3.8 metres or closer to the batsman, he is unable to play it ‘Off the pitch’. Rather he is playing it on the basis of his predictions made at the time of ball release. The conclusion is for the spinner that you should endeavor to make your deliveries as identical to one another as you possibly can, as the skilled batsman’s key cue as to what the ball will do when it lands is taken from your release. Again as club players this would only be the forte of the 1st XI teams I would imagine. The interesting aspect of the Woolmer information is the fact that the Top-Spinner and therefore the smaller Leg Break with the over-spin dip attributes and the potential to really give it some air and keep it up above the eye-level makes this delivery combined with that loopy flight a killer ball. This goes a long way to explain some of the innings of good batsmen that I’ve witnessed coming to very abrupt endings at the hands of small boys and old blokes that are barely able to walk let alone run! The characteristics of their bowling has been very good line and length, combined with loopy flight and perhaps a touch of Top-Spin.